Color, lights, and amazing shopping. In partnership with Shiseido. 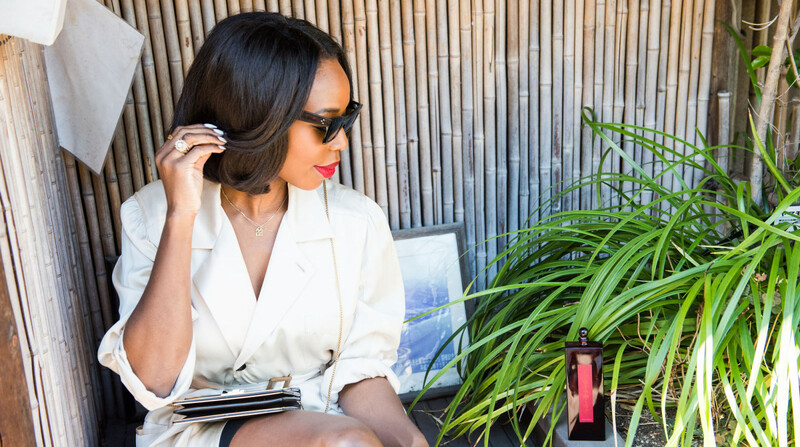 When we flew to Tokyo with Kahlana Barfield to scope out the J-beauty scene, we knew we’d discover a famous beauty culture that is legendary among skin care experts, makeup artists, and hairstylists. But we also knew we’d end up on the most photogenic tour of Tokyo ever. We’ve loved Kahlana’s eye for style and locations for years (you might remember we shot her closet and wedding back in the day), and our week with her in Japan’s capital was like one long master class in skin care, makeup, art, and Instagram. On the itinerary was a mix of beauty hot spots as well as the best new locations (some of which just opened within the past year) to snap the perfect shot. What we learned about J-beauty explained everything about its cult status: quality skin care that adds up to powerful results without a lot of steps, a cutting-edge modern approach informed by a rich heritage, and a certain thoughtfulness to each experience—from the time you buy it to the last drop in the tube. In fact, there’s a Japanese word we learned, omotenashi, which means "selfless service." It’s infused into every aspect of the culture, whether it was the rickshaw drivers who gave us an unforgettable tour of the streets, the exquisitely designed skin care we found at the Shiseido flagship store in Ginza, or the way each purchase at Pigment art store was wrapped like a gift. It made every moment special—and extremely Insta-ready. Below, Kahlana’s city guide of Tokyo. This high-end shopping neighborhood features every major designer on its big, busy roads as well as our favorite, Ginza Six—a luxury mall from heaven with the world’s chicest bookstore at the top. Ginza is also the home of Shiseido, where the company first started in 1872. Today, the newly opened flagship store features a bottom floor filled with testing stations (fun fact: the tiles in the floor are tinted with makeup pigments) and custom Japanese artwork. Upstairs we found a café filled with gorgeous books and private rooms for beauty consultations with the best J-beauty experts. This sprawling art exhibit features enormous immersive light installations that make you feel like you’re on a totally different planet. There’s a room with huge colorful glowing balloons—walking through them is like bouncing along in a cartoon. Another room is strung with long ropes of twinkling LED lights and covered with mirrors so it looks like you’re hovering in the middle of an illuminated rainstorm. 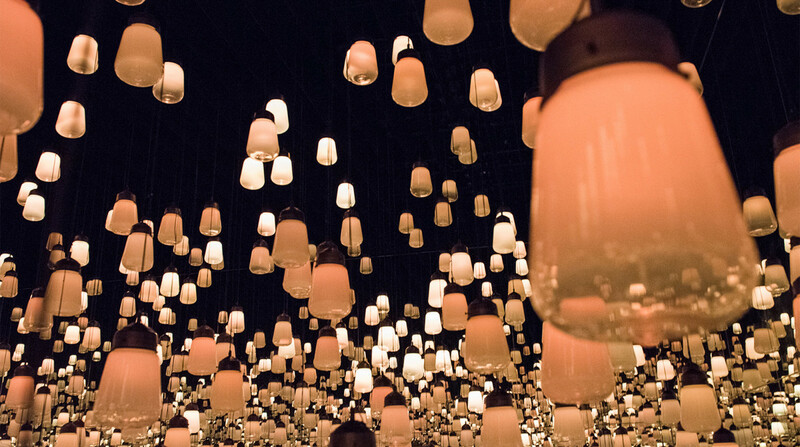 And, in what is possibly the most popular room of all, another space is strewn with softly blinking lights as if you’re floating among lanterns in the sky. Bonus: These luminous experiences also happen to make your skin look really good. (We think a cream like Shiseido Benefiance WrinkleResist24 Day Cream can give you that glow at home, too). When Kahlana began to plan her trip, there was one place she knew she had to see: Bar Zingaro, which is completely devoted to the artwork of popular Japanese artist Takashi Murakami. Found deep inside a shopping center in Tokyo’s Nakano neighborhood, the café is filled with Murakami stuffed toys for sale. Everything you eat—lattes, pancakes, and tiramisu—are marked with the famous Murakami smiling flowers. Even the burger has the flower marked into the bun. 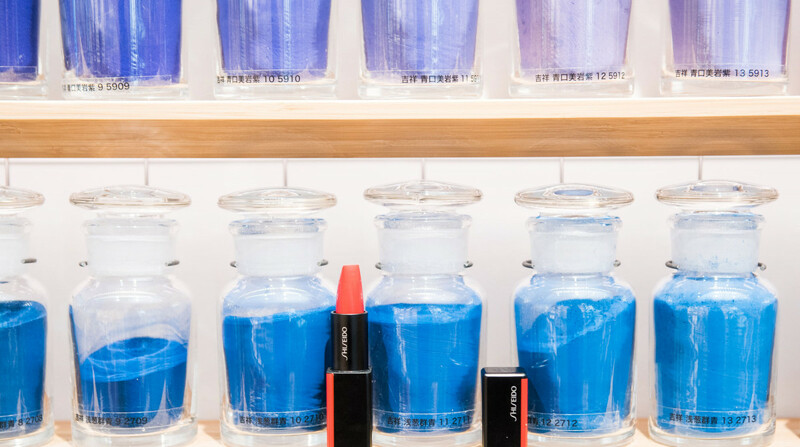 The rich tradition of art in Japan is palpable in everything you see and touch, from the handcrafted teacups to the skincare and makeup you use every day—it’s all designed to a T. That’s what drew Kahlana to Pigment Lab, which is an academy, a museum, and a store devoted to painting. One large wall is covered with meticulously organized jars in an enormous rainbow of powdered pigments that look like the beautifully crafted eyeshadows and lipsticks we saw throughout our trip. Every color you can think of—a dozen variations of cobalt blue alone!—stretch across the lab, and hundreds of Japanese-made paint brushes are lined up in drawers with color-coded handles. If you love painting, art, colorful makeup, or just being hyper-organized, it’s one of the most satisfying places to visit (and photograph yourself!) in Tokyo. At the end of our J-beauty adventure, it admittedly took some elbow grease to zip up our suitcases. Practically spilling out were cult-loved softeners and pre-treatment serums; brilliant lipsticks and high-impact mascaras. But nothing we took home felt superfluous. Japanese beauty, we came to learn, was not about piling on layer upon layer, but about powerful, selective moments that built up to beautiful, healthy skin thanks to cutting-edge technology rooted in the traditions of Japanese culture and rituals. It’s this intersection that makes J beauty stand out to beauty experts around the world and also a crossroads that also defines Tokyo today and all its remarkable locations. We promise you can’t help but take a picture. Shop the story at Shiseido.